The elimination of measles has been achieved in the UK for the first time, the World Health Organization says. The global health body classes a country as having eliminated the disease when it has stopped it freely circulating for at least three years. While there are still small clusters, many of these are brought in from abroad and they are not spreading. But health experts said there should be no complacency, warning there were several large outbreaks across Europe. 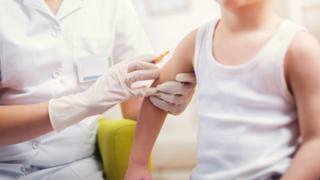 The news comes just a week after it was announced England had achieved the target of getting 95% of children to have had the first dose of the measles, mumps and rubella vaccine by their fifth birthday. Wales, Scotland and Northern Ireland were already achieving it. That figure is considered important because it ensures herd immunity, meaning the disease cannot spread because of the high level of vaccination rates. MMR vaccination rates dipped after a panic caused by discredited former doctor Andrew Wakefield, who falsely claimed in the late 1990s that the jab caused autism. Before that the UK was on track to achieve measles elimination. The announcement does not, however, mean that measles has been wiped out. Last year there were over 500 cases in England, many linked to clusters of cases among young people going to festivals. But what was important was that the disease was not able to spread more widely. During the first six months of this year there have been fewer than 100 cases in England along with small clusters in Wales and Northern Ireland, which were linked to Romania where there is a major outbreak. It marks a major shift from previous years. In 1967 - the year before the vaccine was introduced - there were over 460,000 cases and 99 deaths. By the 1980s that had been brought down to around 10,000 cases a year and even five years ago there were over 2,000 cases a year. Deaths are now rare. Since 2006 there have only been two children who have died from the disease. Dr Mary Ramsay, head of immunisation at Public Health England, said: "This is a huge achievement and a testament to all the hard work by our health professionals in the NHS to ensure that all children and adults are fully protected with two doses of the MMR vaccine. "We need to ensure that this is sustained going forward by maintaining and improving coverage of the MMR vaccine in children and by catching up older children and young adults who missed out." Across Europe 42 out of 53 countries have now achieved elimination status.